Although gray wolves were reintroduced into the Northern Rocky Mountains in 1995, with promises to foster their recovery, wolf persecution resurfaced 14 years later. In March 2009, the Obama administration’s Interior Secretary Ken Salazar activated a Bush administration plan to delist wolves in the Northern Rockies from the Endangered Species Act (ESA). Five hundred wolves were shot that year in Idaho and Montana by hunters and federal agents under the “livestock protection” banner. One legal defender of wolves was a federal judge whose subsequent rulings blocked wolf hunting proposals created by government bureaucrats. Although there are thought to be only 1,500 wolves in Idaho, Montana and Wyoming, these states championed their ranchers’ and elk hunters’ interest in removing wolves from the ESA and legalizing public wolf hunts. Since the ESA passed in 1973, no species has been delisted — stripped of their legal protections — in political bargains, despite the Bush administration’s repeated attempts to weaken the Act. Scientific reasons prompted delistings. But in April 2011’s budget bill, a deal was cut. “Science has been subordinated to political instrumentalism, setting a dangerous precedent for the future,” warned David N.Cassuto, Professor of Law at Pace University School of Law, in an April 19, 2011 editorial in The Christian Science Monitor. On Friday, April 8, 2011, Rep. Mike Simpson (R, ID) and Senator Jon Tester (D, MT) conspired to overturn Judge Donald Molloy’s ruling in U.S. District Court last summer, which returned wolves to the endangered species list, thus safeguarding their lives in the western region. Simpson’s and Tester’s trigger fingers attached an irrelevant rider into the federal budget bill pending before Congress to remove federal protections from the wolves of most of the Northern Rockies. They threw the wolves’ fates to Idaho and Montana hunters. The wolves were in a particularly weak position at this point, as several environmental groups had just attempted to cut a settlement deal to remove ESA protections from wolves. Molloy refused to accept that settlement—on two main grounds. First, Malloy had already ruled that the 2009 delisting was legally flawed, and declined to go back on that ruling. Second, the settlement wouldn’t satisfy all the parties, especially the four environmental groups which, represented by Tutchton, rightly wanted to keep their original court victory. Immediately after Judge Molloy’s ruling against the delisting scheme, Montana’s Senator Tester started talking about delisting wolves as part of his political campaign. Tester, a cattle rancher, is battling Rep. Denny Rehberg (R, MT) in the upcoming 2012 election, and apparently thinks the state’s biggest wolf-hater will garner the most votes. Congressional leaders and the White House gambled that wolf hunting might save Tester’s seat in the Senate, so with a wink and nod, the rider had few votes to slow it down. As noted above, 10 of the 14 plaintiff groups that sued Interior Secretary Ken Salazar and the U.S. 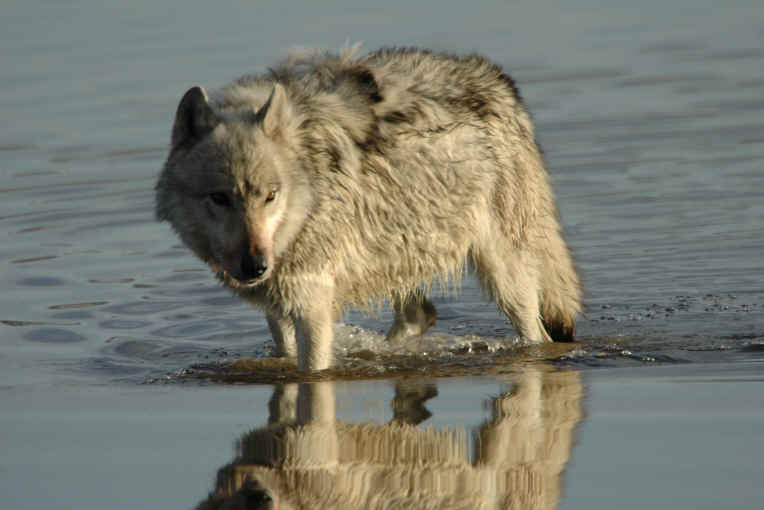 Fish & Wildlife Service to block them from delisting wolves made a strange decision in March 2011. They moved to settle the lawsuit, and place wolves under state management in Idaho and Montana. This would have exposed wolves in two states to public hunts. The groups said such a settlement would protect more wolves than a delisting that eliminates wolf protections in five states. Most oddly of all, the ten groups claimed anti-wolf sentiment would grow if they held the line. They were offering political (not ecological) reasons to compromise. How could “anti-wolf sentiment” get any worse? Idaho’s Gov. Butch Otter already claims “respect” can be the same as “hate” for wolves, and has boasted about joining a wolf trophy hunt. Judge Molloy sided with the four non-settling parties and rejected the settlement on the day Tester and Simpson imposed the wolf rider. A week later, on April 14th, Congress, as expected, approved the budget deal, including the rider that directs Ken Salazar to reinstate the 2009 decision that delists wolves in five states: Idaho, Montana, Washington, Utah and Oregon. Wyoming is expected to follow. Attorney Jay Tutchton warns that once Obama signs the bill, the U.S. Fish & Wildlife Service will re-publish its 2009 delisting rule in the Federal Register and then that rule delisting wolves will be in effect. Ask not why Congressional leaders felt they had read the tea leaves on how environmentalists would react to their reckless, revolting deal-making that preserved the wolf rider in the 2011 budget. Ten groups — a few of them extremely wealthy - showed their disinterest in wrangling with Congress, crafting an unnecessary “settlement” to heave wolves to hunters in Montana and Idaho.